The magnet has three settings: Eco-Power, Nominal-Power and High-Power. It therefore consumes less power for less heavy work. If more power is required, the magnet settings can be adjusted accordingly. This way the electro drum magnets are very sustainable in use. This drum magnet has been developed in order to generate a deep catch field and obtain a clean scrap iron product which raises the market value. The magnet is placed well above the vibrating feeder leading from the shredder and the transport of the iron pieces takes place via the top. This step can be repeated in order to clean the already separated iron fraction a second time, resulting in an even better quality iron scrap. This type of electro drum magnets must be powerful and robust, given the enormous load they have to cope with (many large, sharp iron pieces). The casing is made of wear-resistant material. Goudsmit uses very thick manganese steel for the casing and cleats. An extra wear layer between the cleats is an additional option. The optimisation and saturation of the steel in respect of the magnet coil has been developed to a maximum which results in the creation of a very strong magnetic field. The drum magnets have a format of Ø1500×2000 mm and a maximum power of 15 kW. For smaller shredders, dimensions of Ø1000×1200 mm and 5.5 kW suffice. 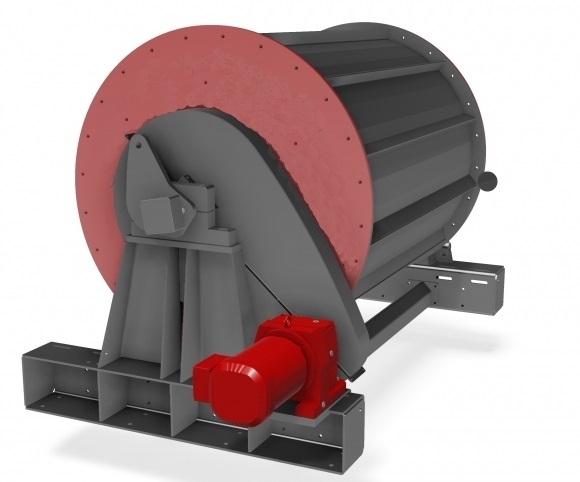 This type of drum magnets is suitable for fraction volumes of up to a maximum of 220 mm and 50 tonnes per hour, depending on the specific situation. Shredder flows, household waste, electric and electronic waste, combustion/steel production slag, minerals, wood processing.